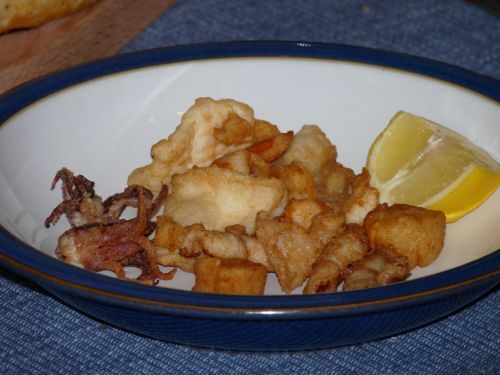 Or Italian for “what on earth can I do with only one plaice and some leftover bait?” Obviously this traditional recipe was invented by Mediterranean anglers long ago who came home with a load of odds and ends, just like us on a less than average day. Quantities are highly variable depending on what is available, but to give you a guide, the following fed two comfortably: one plaice of about a pound, 6 squid, 12 small frozen scallops, 8 raw frozen prawns. Heat the oil in a deep pan until a cube of bread goes brown in 20 seconds. Mix the salt and flour together. Dry the fish etc. on the paper towels, because hot oil and wet fish creates an interesting eruption and you don’t want that unless you are tired of your old kitchen. Toss the fishy bits in the seasoned flour. Drop the floured pieces in the oil, a handful at a time, don’t crowd the pan. They will cook very quickly as they are so small, probably 30 seconds only. Scoop them out when turning brown at the edges and drain them on more kitchen towels. Keep them warm in the oven while you do the next batch. And so on. That’s all there is to it. Serve with lemon squeezed over and more salt. Ours made a meal with a side salad and lots of good fresh crusty bread, washed down with a Peroni if you are cheap like me or a very cold bottle of Italian white if you are not.